1. In France equestrian centres enjoy the relatively low VAT rate of 5.5% or 7%. In a judgement handed down on 8 March (1), the EU Court of Justice ruled that France incorrectly applied the directive on the common system of value added tax (VAT) (2) by applying a reduced rate to certain transactions related to equidae. The court upheld the European Commission’s first grievance whereby France may not apply a reduced rate (5.5%) to transactions related to horses when these animals are not intended for use in the preparation of foodstuffs or in agricultural production. It maintained that the directive authorises a reduced VAT rate for live animals “normally” intended for use in the preparation of foodstuffs and for transactions related to equidae, particularly horses, for agricultural, forestry or fishery activities, to the extent that they constitute deliveries or services intended for use in agricultural production. 3. The equestrian brigade (the cavaliers) are seen to be part of the privileged classes and as such a clear target for Francois Hollande and his old-fashioned class warfare objectives. The EU directive gives Hollande a wonderful excuse to triple VAT on the cavaliers. But for the cavaliers Hollande is not the right horse to bet on. The Guardian: François Hollande’s plan to treble VAT on equestrian centres will ‘send 80,000 horses to the abattoir’, warns industry. A French mood of mutiny that has rippled through Brittany and infected teachers, farmers and shopkeepers, skipped species on Sunday when horses took to the streets of Paris to complain about tax rises. Thousands of disgruntled horse and pony riders rode through the French capital to complain about tax increases they say will put many of them out of business and send 80,000 animals to the abattoir. 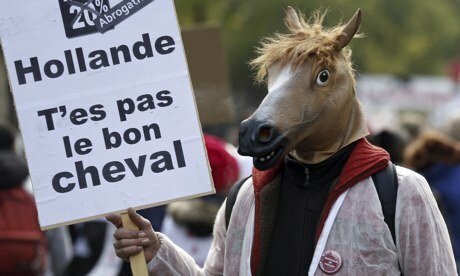 The “cavaliers” blocked roads from the symbolic Paris squares, Place d’Italie, Place de la Bastille and Place de la Nation, in protest at government plans to almost treble VAT on equestrian centres. It was the latest manifestation of the growing revolt over President François Hollande’s tax reforms, many of them aimed at reducing the country’s public deficit to meet European Union demands. The EU bureaucracy is essentially “socialist” in that they are all paid for by taxes and they will do anything to make work for themselves and to expand their areas of work to ensure their own continuance. Support for all forms of publicly funded bureaucracy seems to be the core value of all socialist parties in Europe. If there was any group which needed to be disenfranchised it must be those who live off public funding – and not only in the EU but also within the member countries of the EU. Of course that line of thought leads to all politicians being banned from voting. And maybe that would not be so bad either. This only reconfirms my view that the European Parliament is not worthy of any respect and is worthy of much contempt. A typical day in the European Parliament as MEPs get ready for a vote. But there is a problem. One MEP stands up and explains that the room has no idea what it is voting on, as they haven’t yet been given a chance to read the alterations to the amendments about to be passed. The response? – “That’s the way we do things here”. In the developing world venality is often a matter of survival. In Europe venal behaviour is a matter of choice. The EU bureaucracy in Brussels has corruption in its genes and tax-payer’s money running through its veins. It is remarkable that so many ostensibly democratic countries (at least in name) have so easily surrendered their powers to a bloated and corrupt group in Brussels. It is not Best in Class that applies. The Least Common Factor applies in Europe. Brussels is as corrupt and as wasteful and as inefficient as the worst country in Europe. In this case the corruption and the condoning of corruption in Brussels is as bad as in Greece. And corruption in Greece was not a small contributor to their financial problems. Anti-corruption officials in Brussels have failed to investigate reports of squandered EU funds at a training institute in Greece, a German paper reported Friday. Well-connected teachers were allegedly paid up to €610 per hour for up to 225 work hours per month. The European Anti-Fraud Office (OLAF) has reportedly ignored repeated tip-offs about squandered European Union funds in Greece, according to an article in the Friday edition of the Süddeutsche Zeitung. The German daily reports that a Greek civil servant uncovered multiple cases of nepotism and vastly inflated salaries while inspecting the finances of a vocational training institute. Officials in Brussels have apparently not acted on any of the whistleblower’s suspicions, which he communicated in several letters, the paper added. According to the newspaper report, Giorgos Boutos, a government finance official in Athens, began auditing the books of the Organization for Vocation Education and Training (OEEK) in 2006. The institute receives and distributes EU funds earmarked for vocational training in Greece. Boutros repeatedly stumbled upon irregularities and documented the cases in numerous letters to OLAF. …. The case involves at least €6 million ($8.2 million). It’s not an excessive sum of money, but it is well documented. Boutos was able to substantiate the irregularities in his letters to the EU with contracts, hotel bills and bank statements. He reportedly found that 75 percent of the misappropriated money had come from the EU. The details provided by the Süddeutsche Zeitung are sure to raise eyebrows. Some of the instructors are said to have been paid for up to 225 hours per month, even during periods when they were abroad. Hourly wages for teachers were reportedly as high as €610. The alleged corruption was compounded by apparent instances of nepotism: The son of a cabinet member taught a course on silver-plating watches, the wife of a Socialist politician led classes on both dentistry and geography, and relatives of the institute’s leader held jobs there. ….. It wasn’t until seven months — and several more inquiries — later that Boutos received fresh news about the case. Still, that letter merely stated that OLAF was in the process of “a comprehensive reorganization,” and asked him to be patient. Meanwhile, Boutos told the newspaper, many similar cases of misspent EU funds now fall under the statute of limitations because the EU took too long to address them. Exactly €516,000 of misappropriated EU funds have been repaid. But Boutros stressed that the EU could demand that all such funds be paid back — that is, if it really wanted to. Boutos also questioned whether investigations had been delayed because some suspected fraud cases involved relatives of government and party officials — or whether Brussels even cared at all about such instances. It’s the right decision of course. The proposal was for yet another one of the many EU rules where the benefits are doubtful and the implementation would have had no measurable effects on the desired outcome. But entirely due to German protectionism for its performance car industry – and much to the disappointment of Ford – the limit of 95g of CO2 per km for any vehicle’s emissions has now been delayed at least till 2024! Well Done Germany! The EU’s CO2 restrictions proposals for power plants and for aircraft and this one for cars are part of of a long line of “feel-good” proposals which the Greens are so fond of — full of sound and idiocy, accomplishing nothing. So far the EU has not proposed any restrictions on CO2 in human breath. Hopefully by 2024, the idiocy of CO2 restrictions will have been recognised. The German government has persuaded its EU partners to delay introducing new limits on CO2 emissions from cars. Environment ministers agreed to revise a deal, reached in July, that set a limit of 95g per km for the average car. That target for CO2 emissions was to take effect in 2020. But Germany, famous for its high-performance cars, says the 95g limit should not take full effect until 2024. Green activists deplored the new delay as a “shameful sop” to polluters. A leading German Green Party MEP, Rebecca Harms, accused Germany’s Chancellor Angela Merkel of “riding roughshod” over the EU’s democratic process, because the 2020 agreement had already been reached between the European Parliament and the Council – the EU ministerial grouping. “Weakening the agreed 2020 limits, which have long been known, is a shameful sop to German car manufacturers and will slow the development of new technologies to deliver more efficient and less polluting cars,” Ms Harms said after the ministers’ vote. …. The UK was among the countries that supported the German environment minister’s position on Monday, German ARD news reports. The German minister, Peter Altmaier, said “it’s not a fight over principles but how we bind the necessary clarity in climate protection with the required flexibility and competitiveness to protect the car industry in Europe”. 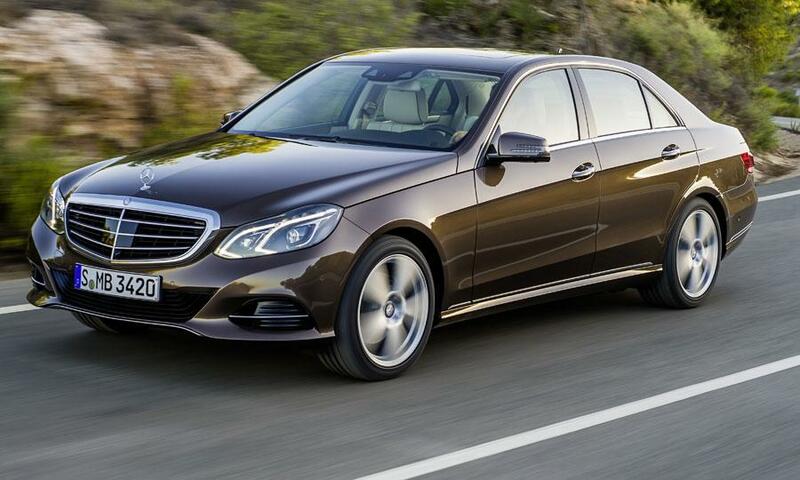 Correspondents say there has been intense lobbying by luxury carmakers such as BMW and Daimler, maker of Mercedes, over the EU legislation. The emissions limits are part of the EU’s drive to switch Europe to a low-carbon economy and slow the impact of climate change. Heat does not hide. It always flows towards lower temperatures. Global warmists are now scrambling to explain why global temperatures have not been rising for the best part of two decades even though carbon dioxide concentrations keep increasing. That man-made carbon dioxide emissions may not be as important as they have fantasised is heretical and not an acceptable explanation. Instead they claim that the warming has been going on all along but the “heat is hiding” probably in the deep oceans! How on earth it got there remains a mystery. Has it never “hidden” there before? Why just the deep oceans? Why not in the Earth’s mantle? U.S. and European Union envoys are seeking more clarity from the United Nations on a slowdown in global warming that climate skeptics have cited as a reason not to “panic” about environmental changes, leaked documents show. They’re requesting that more details on the so-called “hiatus” be included in a key document set to be debated at a UN conference next month that will summarize the latest scientific conclusions on climate change. … ..
A draft of the summary and the underlying 2,200-page report from the UN Intergovernmental Panel on Climate Change were obtained by Bloomberg from a person with official access to the documents who declined to be further identified because it hasn’t been published. Government envoys from around the world will debate the final wording of the summary at an IPCC meeting that starts in Stockholm on Sept. 23. That document, formally the Summary for Policymakers, is designed to be used by ministers working to devise by 2015 a global treaty to curb climate change. …. … The current version of the summary needs more information about the hiatus, according to the EU and the U.S.
….. The slowdown came as emissions grew, with the concentration of carbon dioxide in the atmosphere this year exceeding 400 parts per million for the first time on record. The draft report includes possible reasons for the slowing rate, including natural variability, volcanic eruptions and a drop in solar energy reaching the Earth. “Much of the information is present but it requires a lot of effort on the part of the reader to piece it all together,” the 28-nation EU said in the comments document. Norway, Denmark and China requested information on the role oceans have played in the slowdown. Croatia joined the EU today as the 28th member state. (But I can’t help concluding that both Croatia and the EU are consequently disadvantaged. At least Croatia is not joining the Euro which it can ill afford to do). After Slovenia it is the second of the former Yugoslavia countries to enter. In the meantime the “negotiations” for Turkey’s membership are proceeding at a glacial pace. Any possible excuse is used to slow down progress whenever possible. The opposition to Turkey’s membership is not restricted to Germany, Austria and France where it is particularly obvious. Considering the other states deriving from Yugoslavia, Bosnia applied for membership in 2003 but has not yet been officially accepted as a candidate nation. Macedonia applied in 2005 and is accepted as a candidate country. Serbia applied for EU membership in 2009 and is accepted as a candidate nation. Negotiations with Montenegro started in 2012. Kosovo has not yet been allowed to apply. It is not the protests in Turkey but Erdogan’s hard-handed approach to quelling the protests which may have blown Turkeys chances of joining the EU. It is his response which provides a “politically correct” cloak under which many of those opposed to Turkey’s membership of the EU can hide. Their opposition is primarily because Turkey is an Islamist nation, but the police actions in Turkey come in very handy to hide behind. They can now use Erdogan’s “undemocratic” behaviour as their visible justification for their opposition. Angela Merkel and Germany have long been opposed to Turkey’s membership but have had to walk the tightrope of opposing while not seeming to be giving in to the neo-Nazis and their anti-Turkish campaigns within Germany. I caught Angela Merkel on TV two days ago and she was “apalled, utterly apalled” at the hard response of Erdogan’s police. Hurriyet: Chancellor Angela Merkel’s conservatives have rejected Turkish membership in the European Union in their German election programme, saying the country would “overburden” the bloc because of its size and economy. The Christian Democratic Union (CDU) and its Bavarian sister party, the Christian Social Union (CSU), have long opposed Turkey joining the 27-nation bloc, but haven’t stood in the way of EU accession talks that were launched shortly before Merkel took office. The German line has hardened in recent weeks however because of Ankara’s tough response to three weeks of protests against Prime Minister Tayyip Erdoğan. On June 17, Merkel said she was “appalled” at Turkey’s handling of the protests, which have turned into fierce clashes between police firing teargas and water cannon, and masked demonstrators throwing bottles and other missiles. Turkey’s application to accede to the EU was first made 26 years ago in 1987. Turkey has been an associate member of the European Union (EU) and its predecessors since 1963. After the ten founding members, Turkey was one of the first countries to become a member of the Council of Europe in 1949, and was also a founding member of the Organisation for Economic Co-operation and Development (OECD) in 1961 and the Organization for Security and Co-operation in Europe (OSCE) in 1973. The country has also been an associate member of the Western European Union since 1992, and is a part of the “Western Europe” branch of the Western European and Others Group (WEOG) at the United Nations. Turkey signed a Customs Union agreement with the EU in 1995 and was officially recognised as a candidate for full membership on 12 December 1999, at the Helsinki summit of the European Council. All things going well with the negotiations, membership would be on track for 2015. But there is fundamental opposition to an Islamist country of over 70 million becoming a full member. Sarkozy and the right in France were ( and still are) implacably opposed. For many Austrians, Turkey becoming a member would be close to sacrilege. The Spanish remember El Cid (Rodrigo Diaz de Vivar). Brussels (Barroso) has stated that full membership could – at the earliest – come by 2021. Turkey has implied that 2023 – when modern Turkey is 100 years old – may be a deadline. In December 2011, a poll showed that as much as 71% of the participants surveyed in Austria, the Czech Republic, France, Germany, Italy, Poland, Spain and the UK were opposed to Turkey’s membership in the European Union. Erdogan’s response to the protests could well provide the cover for the anti-Islamist forces in Europe to prevent Turkey’s accession to the EU for the foreseeable future. It has been a pointless waste. Just to pander to the superstition that controlling carbon dioxide emissions can control global temperature. Temperatures have been flat since 1997 while human emissions of carbon dioxide have risen around 30%. Carbon dioxide concentrations in the atmosphere have also increased but have had little impact on global temperature – if any at all. The last three decades have seen the vilification of carbon dioxide and the combustion of fossil fuels but it has been a pointless and expensive exercise. The profligate subsidies in favour of renewable energy and the shameless taxation of fossil fuel use and the consequent increase of energy prices have made their contributions to the economic slowdown and loss of jobs – particularly in Europe. The cowardly adoption of political correctness and of “green” energy is proving expensive – and has been quite needless. Today electricity prices in Europe are at least 50% higher and perhaps twice as high as they need to be. The curbing of fossil fuel use and the hysteria about nuclear power together with the renewable profligacy are responsible for that. The cost of electricity is a fundamental parameter in our economies which feeds its way into every aspect of economic activity. It is the availability of affordable electricity which has been the driver of growth for over 100 years. A simple estimate of the growth that has been prevented by having unnecessarily high electricity prices gives the cost as being about 15 million jobs within the European Union. …. As the bottom falls out of the man-made climate change industry, those who were among its most bullish investors at the height of the scam are now covering their positions in a bear market. 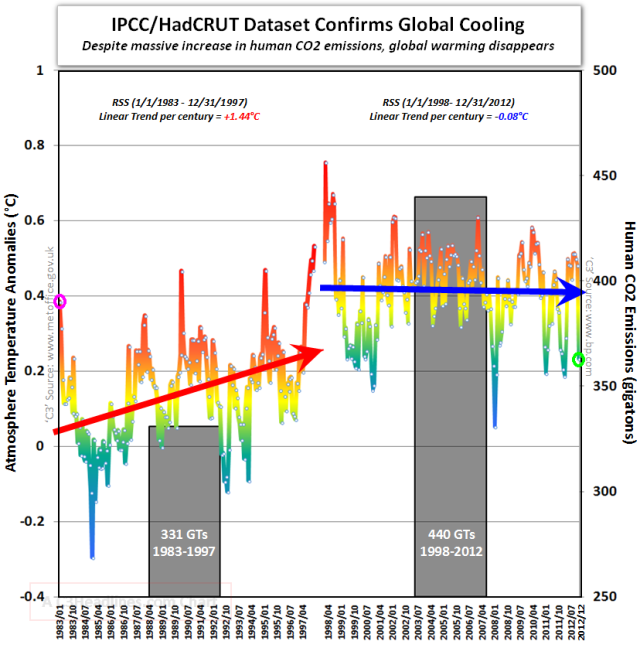 Great damage was done to this much-hyped imposture by Climategate (“Hide the decline!”), by the discredited “hockey stick”, by the farce over “melting” Himalayan glaciers and the “decrease” in the polar bear population from 5,000 in 1970 to 25,000 today. Yet what has chiefly discredited the climate change superstition is the basic, inescapable fact that there has been no global warming since 1997. The official face-saving response is that this is a “pause” in an otherwise menacing trend – a pause of a decade and a half. The warmist fanatics will freeze to death in their solar bunkers before they will admit defeat; but the more worldly wise, especially scientists anxious to preserve a vestige of academic credibility, are now striving to effect a withdrawal in good order. Even the Intergovernmental Panel on Climate Change began to ratchet down its more extravagant predictions as early as 2007. In 2010 the Royal Society reviewed its stance on the Anthropogenic Global Warming theory and assumed a more neutral position. Since then, it has been like the retreat from Moscow: last month Oxford scientists, albeit in Delphic language, moderated forecasts of climate disaster. …..
….. The global warming hysteria began in the 1880s but was discredited when its prediction that CO2 would increase the mean global temperature by more than 1C by 1940 was not borne out. What gave it fresh life over the past two decades was the realisation by governments that it could provide a pretext for taxing citizens to unprecedented levels and by private entrepreneurs that government subsidies could supply a dripping roast. Of all the damage that politicians have inflicted on the public, the “green” scam has been among the most extreme. …… South of the Border a modicum of sanity has entered government thinking since UK energy minister John Hayes’ “Enough is enough” remarks. In England and Wales turbines are falling out of favour. Not so in Scotland. ……. Local objections to wind farms are routinely overruled by central government (that would be the listening, accountable Scottish Nationalist government). At the end of last year only ten out of Scotland’s 32 local authorities admitted to knowing how many wind turbines were sited in their areas. They could cover every inch of Scottish soil with Martian whirligigs and the lights will still go out, due to the SNP’s refusal to replace Hunterston B, due to close in 2016, and Torness, closing in 2023. All this to satisfy a superstition: if all mankind stopped producing CO2 (try selling that idea in China and India), 96.5 per cent would remain. The climate Anabaptists will never recant, but their mad creed is doomed all the same. Wind turbines and solar energy have their place in the energy mix we should use. But not at the expense of fossil fuel and nuclear use. My opinion on whether the UK should remain within the EU or leave has no locus standi and, in that sense, is irrelevant. But I find the sham promises of an EU referendum by politicians is behaviour which is interesting. Anything which curbs the growth of the EU bureaucracy and the European Parliament is – I think – a good thing. I certainly think that the UK – and Sweden – should continue to stay well clear of the Euro where I think the experiment is failing. The current noise in the UK around a future referendum about staying in or leaving the EU seems very contrived to me. Prime Minister Cameron promises an EU referendum after the next election only to try and gain the anti-EU support for the purposes of the election. He has no real intention of allowing any referendum to come to a decision to leave and everybody knows it. Any cosmetic re-negotiation of terms of membership will be known by all parties to be cosmetic and will have little focus. The only way that I can see that any such referendum would be meaningful – in any member state – is if it is held after the member state invokes Article 50 to leave the EU. The subsequent negotiations for an Agreement to Leave would then have a 2 year time limit and would have no option but to be sharp and focused. There would be no difficulty in withdrawing the invocation of Article 50 provided the referendum was held within the two year dead-line and decided that membership would continue. Any member state which really wishes to have meaningful negotiations about EU membership must first invoke Article 50. Both options would then be truly open. Without this any referendum would be without teeth and any result “to leave” would be a hollow one. By far the best negotiating position for a member state would be with an invocation of Article 50 to be followed by immediate negotiations and a referendum about 20 months later. A parliamentary vote to invoke Article 50, then negotiations culminating in a referendum towards the end of the 2-year period would be the proper way to go. Reuters reports that EU politicians are to meet at a summit to reassess energy policy in the post-fracking world (and – but this is not to be admitted under pain of being shunned – a post-global-warming reality). I just note that politicians will be the most adept at changing direction aand taking credit for moving away from global warming orthodoxy. Many scientists will find their own exit strategies but many will find it difficult to find the rationale to move away from what has become their religion and their livelihood. The least adept at embracing the new reality will the “climate bureaucrats” whose comfortable existence depends upon the global warming religion continuing in force. And all those who have milked the EU subsidy regime for all its worth will not be pleased but they will just move on to the next scam. (Reuters) – EU heads of state and government will seek ways to limit the impact of energy costs on European competitiveness at a summit this month, a draft document seen by Reuters showed. European industry says it is disadvantaged because of the price it pays for energy compared with the United States, where the shale gas revolution has drastically lowered costs. The document ahead of the May 22 EU summit, which has energy and taxation on the agenda, calls for examination of the impact of energy prices and costs and action to limit the effects. One option is developing the European Union’s own shale gas resources, although this is not mentioned directly. Instead, the draft refers to safe and sustainable development of “indigenous sources of energy”. Europe’s very different geography and land ownership would make it hard for the European Union to rival the United States in shale gas, but the executive European Commission is working on a framework to guide prospectors. The leaders are expected to urge the Commission to analyze energy prices and costs in member states “with a particular focus on the EU’s competitiveness” against global rivals. The draft also points to massive investment costs in boosting power generation and networks as likely to drive up energy prices. Arguments over energy costs have featured prominently in political debate ahead of German elections and played a part in blocking a Commission proposal to boost carbon prices on the EU market. The Emissions Trading Scheme (ETS), where carbon prices have sunk to record lows, is not on the draft agenda, but it could be debated on the sidelines of the summit, EU sources have said. Efforts to repair that market are also a focus of attention for the European Parliament.